Explosions in a Nigerian market kill more than 100 as terror concerns mount. Primary elections across the country produce few surprises. The NBA makes its case against Donald Sterling. And a ground beef recall expands nationwide. Mini-Super Tuesday: It was billed as a marquee matchup, but in the end it was an easy night for Mitch McConnell. The five-term Republican senator from Kentucky easily defeated a tea party-backed challenger in yesterday's primary. In another high-profile race, this time in Georgia, Republican businessman David Perdue will face off against Rep. Jack Kingston in a July runoff election. The winner meets Michelle Nunn, daughter of former Sen. Sam Nunn, in the general election. 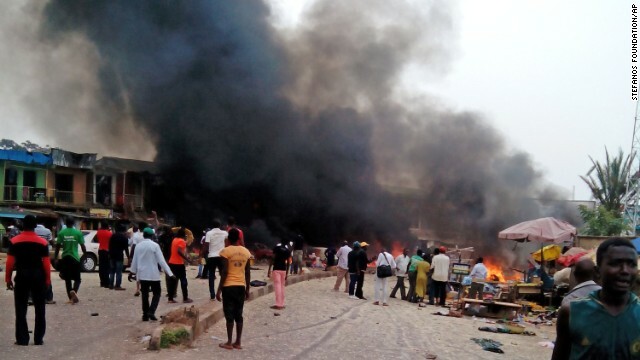 Deadly violence: A pair of explosions at a market in central Nigeria yesterday killed 118 people, officials said. The blasts targeted the Terminus market and went off some 20 to 30 minutes apart. Terrorism in Nigeria has been in the spotlight recently since more than 200 schoolgirls were kidnapped by the militant group Boko Haram. The terror group abducted 276 girls in April from a boarding school in Chibok in northeastern Nigeria. Dozens escaped, but more than 200 girls are still missing. Making a case: The NBA is out with a 30-page document detailing the charges against Donald Sterling. The summary obtained by the L.A. Times could lead to NBA owners voting to strip Sterling and his wife, Shelly, of the Los Angeles Clippers. They've co-owned the franchise for 33 years. In addition to making racist remarks, Sterling is accused of trying to persuade his friend V. Stiviano to lie to league investigators. There are many, many other examples. Four states and counting: The United States Food Safety and Inspection Service is recalling 1.8 million pounds of ground beef products over fears they may be contaminated with E. coli. The recall was initially limited to a handful of states, but the agency now fears the meat may have been distributed nationwide. PR 101: Here's how NOT to enter a discussion about bullying. Maybe think twice before telling the kids they need to "grow a pair." - Bearly made it: Mama bear saves baby bear from getting squashed. Everyone say, "aw." - Ringtone jam: It's like getting a call on your iPhone, but with a better beat. - Football poltergeist: Some folks think they see a ghost in this televised soccer match. Others believe it's just the reverse, or negative image of one of the real players on the field. - Inspiring pauses: Parker Mantell delivered a powerful commencement address at Indiana University. He's also a stutterer. - What could be more fun? It's time for "Rodents on Turntables." Parker Mantell's premise that educators and others (as a general rule except those at IU) do not inspire people with disabilities to achieve and succeed is absolute BS. While there may be some in this category, the majority of people – educators and other reasonably intelligent members of our society realize that people with speech impediments and other issues can achieve great things. My daughter had a speech impediment AND suffered from auditory discrimination. Through years of therapy and support from family and teachers she has been remarkably successful and happy. It is not my goal to take away from this young man's achievements but it appears his stuttering is of limited nature (even in the stressful environment of public speaking) and it would have been more accurate and more impressive if he had acknowledged the wonderful support people like he receive all across our great nation. I wish him well. And, I wish the thousands of educators and family members who help people with such issues lead happy and successful lives to understand they are loved and appreciated. How about instead of talking about the NBA for the inth day in a row, we talk about the marine who was lost during a training in the Carolinas? He fell out of an airplane and was missing for a full day before the body was recovered. Seems a bit more important than the farce that is Donald Sterling gracing this page every day. CNN is also covering this very sad story. Parker Mantell's commencement address was profound. The world is his and to all whom dare to follow.